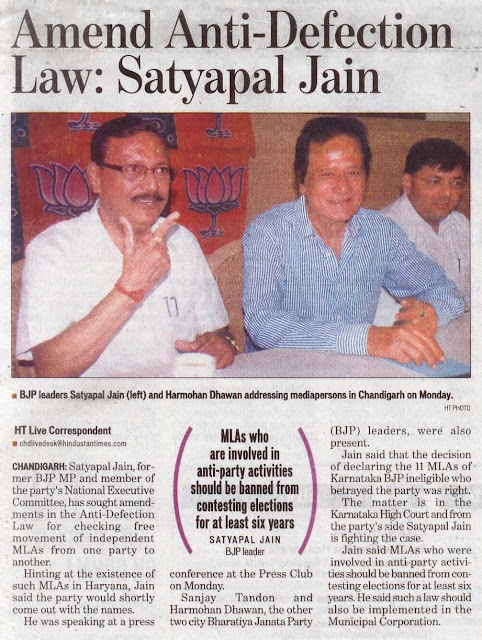 Nov 02 2010, Chandigarh: Satyapal Jain, former BJP MP and member of the party's National Executive Committee, has sought amendments in the Anti-Defection Law for checking free movement of independent MLAs from one party to another. Hinting at the existence of such MLAs in Haryana, Jain said the party would shortly come out with the names. He was speaking at a press conference at the Press Club on Monday. Sanjay Tandon and Harmohan Dhawan, the other two city Bharatiya Janata Party (BJP) leaders, were also present. Jain said that the decision of declaring the 11 MLAs of Karnataka BJP ineligible who betrayed the party was right. The matter is in the Karnataka High Court and from the party's side Satyapal Jain is fighting the case. Jain said MLAs who were involved in anti-party activities should be banned from contesting elections for at least six years. He said such a law should also be implemented in the Municipal Corporation.